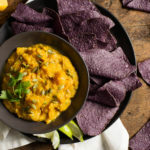 A nice change from hummus or salsa, this spice-roasted butternut squash dip can be served as a healthy snack or party appetizer. Preheat oven to 375˚F (190˚C). In large bowl, toss together squash, 2 tbsp (30 mL) oil, 1 1/4 tsp (6 mL) curry powder, cumin, coriander, half of the salt and pepper, ginger and cayenne. Arrange in single layer on parchment paper–lined baking sheet; bake for about 30 minutes or until golden brown and tender. Let cool completely. In food processor, combine squash, lime juice, 2 tbsp (30 mL) oil, 2 tbsp (30 mL) water, honey, garlic, and remaining salt and pepper until smooth. Fold in red onion, 2 tbsp (30 mL) cilantro, and jalapeño. Scrape into serving bowl. Sprinkle with pumpkin seeds, and remaining cilantro and curry powder. Drizzle with remaining oil. Serve with tortilla chips. For a creamier texture, fold in a few tablespoons of yogurt or sour cream. Alternatively, serve with grilled naan bread or pita bread. Substitute almonds or pine nuts for pumpkin seeds if desired.